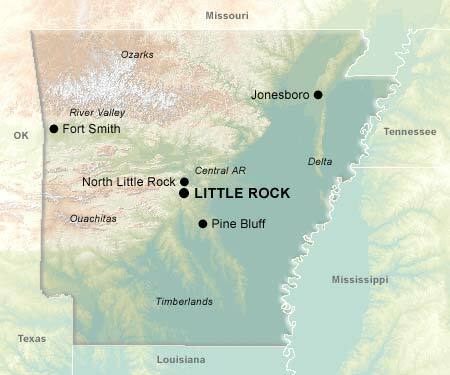 One of the most appealing qualities of Arkansas is its leisurely pace of life, at least outside of the capital city of Little Rock. Those accustomed to the frenzy of urban existence may find themselves disoriented at first as they decompress and adjust to the atmosphere of one of the most rural states in the US, then delighted as their stay continues. After settling into the relaxing thermal pools of Hot Springs National Park, almost no one wants to leave. Tourism has played an increasing role in the Arkansas economy, which was once dominated by agriculture and manufacturing. The Ozark Mountains and Ouachita mountain ranges, settled by hardy Appalachian populations moving west, have been developed more aggressively in recent years, with resorts and vacation homes springing up. Yet the residents retain the individualism and independence characteristic of their ancestors. Two famous Arkansas natives have had a substantial impact on the United States and the world. Sam Walton, founder of Wal-Mart, started his chain of retail mega-stores in Rogers, Arkansas, in 1962. William Jefferson Clinton, 42nd president of the United States, was born in Hope, and spent much of his youth in Hot Springs.